The electrical current passing through a transistor is conducted by a slice of silicon. In the new transistor, this is sandwiched between layers of piezoelectric material. As this material (shown in red) expands, the silicon (shown in blue) is compressed. Transistors, the workhorses of the electronics world, are plagued by leakage current. This results in unnecessary energy losses, which is why smartphones and laptops, for example, have to be recharged so often. 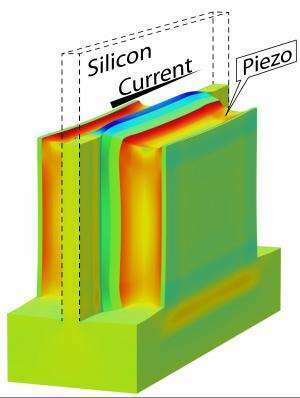 Tom van Hemert and Ray Hueting of the University of Twente's MESA+ Institute for Nanotechnology have shown that this leakage current can be radically reduced by "squeezing" the transistor with a piezoelectric material (which expands or contracts when an electrical charge is applied to it). Using this approach, they have smashed the theoretical limit for leakage current. Tom van Hemert will defend his PhD dissertation on 6 December. If silicon is squeezed, this affects the freedom of movement of the electrons in this material. This can promote or restrict the flow of electrical current. Compare it to a garden hose. When you stand on it, less water comes out. But strangely enough, the flow of electrons in silicon actually increases when the material is compressed. In modern microchips, every single transistor is continuously exposed to enormous pressures of up to 10,000 atmospheres. This pressure is sealed in during the manufacturing process, by surrounding the transistors with compressive materials. While this boosts the chip's processing speed, the leakage current also increases. The use of piezoelectric material means that the transistors are only put under pressure when this is necessary. This can generate considerable savings in terms of energy consumption. The underlying concept was originally developed by Ray Hueting. In order to turn this into reality, Tom van Hemert had to find a way of linking theories of mechanical deformation with quantum-mechanical formulas describing the electrical behaviour of transistors. The calculations indicate that "garden hose transistors" are much better than conventional transistors at switching from off to on. According to the classical theoretical limit, a charge of at least 60 millivolts is needed to make a transistor conduct ten times more electricity. The piezoelectric transistor uses just 50 millivolts. As a result, either the leakage current can be reduced, or more current can be carried in the on-state. Either way, this will boost the performance of modern microchips, while - importantly - cutting their energy consumption. The results of this research were recently published in a leading journal, Transactions on Electron Devices. On 6 December, Tom van Hemert hopes to be awarded a Phd for his dissertation, which is entitled "Tailoring strain in microelectronic devices". I always thought that most of the losses in CMOS semiconductors were due to junction capacitance and switching losses. Leakage is a very small part of the equation. What are the losses associated with turning this piezoelectric junction on and off?